An index for all things mountainous, the peaks themselves, those found on them, and what can happen on them. Appease the Volcano God: Throwing living people in volcanic craters to stop volcanos from erupting. Chekhov's Volcano: If there's a volcano in a story, it will erupt at some point. Death Mountain: The mountain level in video games. Flower from the Mountaintop: A rare or precious flower that has to be retrieved through a difficult mountain expedition. Hair-Trigger Avalanche: Any and all sounds in the mountains will trigger avalanches. 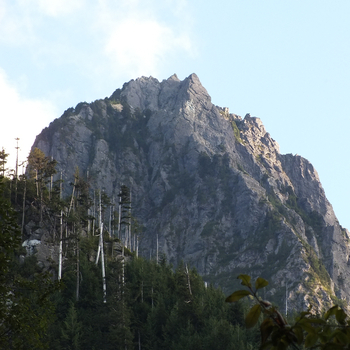 Monster-Shaped Mountain: A mountain that's shaped like a monster or a face. The Mountains of Illinois: Works put mountains where, in Real Life, there aren't any. Rushmore Refacement: Villains adding their faces to Mount Rushmore. Scaling the Summit: A dangerous, challenging expedition to the peak of a harsh, high mountain. The Shangri-La: An enclave of monks and mystics hidden high in the mountains of The Far East. Volcano Lair: Supervillains make their lairs inside volcanoes. Yodel Land: The Hollywood Atlas version of Switzerland, the rest of the Alps, and often southern Germany. Expect dirndls and scenic peaks.